A first date can give a senior butterflies, and their nervousness may cause them to blurt out inappropriate comments guaranteed to make their date head for the exit. Live television offers a way to avoid committing these faux pas – implement a two-second delay. I wrote a boomer dating book because so many seniors, recently single seniors in particular, struggle with online dating. Some become so jaded and/or fatigued by it that they quit dating altogether, which is unfortunate and unnecessary. And while online dating is not an exact science, it is predictable in terms of whether a dater is likely to succeed. I define success as finding a life partner. Here's a tip that take some of the drama out of a first date, which is the best and perhaps only chance to create a good impression. First dates are often challenging and occasionally scary events. And while frightening a date isn't any senior dater's game plan, if first date strangers don't filter what they share that can be the effect. Because let's be honest – the end goal here is determining whether it could lead to a second date. Nearly every senior has had unfortunate experiences they wish hadn't happened. And while some were sad or perhaps tragic, they're more appropriately shared after a couple knows one another well enough to want to hear each other's unedited histories. Filtering is critical, and it means considering how a stranger might react to what you're about to say before you actually say it. I've written about the importance of emotional honesty in relationships, even while dating, but the level of emotional sharing has to be gradual. Even if your first date seems open to hearing your story, that doesn't necessarily mean they're prepared to hear the unedited version yet. So, what's appropriate? Susan's a single senior friend who shared a story about a coffee date she'd had recently with a boomer fellow she met online. They were just minutes into their date when he began reciting a list of his medical issues, including the medications he took for each. He rambled on about his health for so long that Susan wondered whether he was looking for a date or a nurse. Sure, medical issues should be disclosed at some point in a fledgling relationship, but that point isn't on a first date. Susan asked me why a guy would do such an obviously inappropriate thing. I didn't have an answer, but I did know it was over the top unfiltered. I had a coffee date with a senior woman I'd met online whose profile I found intriguing. She'd had a host of careers in her sixty something years, including a professional opera singer. While I'm not a huge opera fan I considered her profound accomplishments as attractive as her physical appearance. We were having a pleasant conversation about the arts when for no apparent reason she told me she'd had four abortions. I nearly did a Mel Brooks with a mouthful of coffee, and I had to control the reflex not to spray my coffee in her direction. It was downhill after that because I was worried what else she might share with a stranger. Another friend, Phyllis had a date with a senior fellow she'd met online. Her car was in for service so he volunteered to pick her up at her home. They walked to his car, he opened her passenger door, looked her in the eye, and said, “You're equal now so this is the last time I'll open any doors for you." The evening didn't improve. She couldn't imagine why he hadn't filtered that foolish, charged comment or why he hadn't realized that it was grossly inappropriate. It was too much of a stretch for her to believe that his caustic, first date remark would be his last and she declined a second date. Boomer daters can prevent blurting if they install a mental time delay mechanism in their heads similar to that which live television uses to avoid airing F-bombs. I'm not suggesting every comment has to be filtered, but rather to pause long enough to consider what you're about to say before blurting it out. If you play what you're considering saying in your head, first you might spare you and your date some embarrassment and perhaps an abrupt end to the date. Relationships that unfold naturally feel more comfortable than those that feel pressured. Someone who prematurely shares every aspect of his or her life gives the impression they're in a hurry to cement a relationship, even though there's no basis for one yet. And in terms of medical issues, many seniors have non-life threatening medical issues that wouldn't interfere with the quality of a relationship, but that information is still best shared when the topic of health comes up later on. Take your time when you're on a first date with a stranger. Try not to create pressure on yourself to be so honest that you blurt out wildly inappropriate statements. If honesty is your rationale for purposely sharing everything that's occurred in your life with a stranger, then at least consider that it's unacceptable first date behavior. Being honest on a first date doesn't mean telling a stranger everything that's ever happened in your life. Filtering isn't dishonest. It's smart dating and good manners. 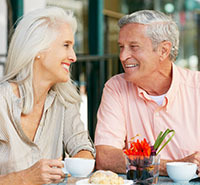 There's no doubt about it – senior online dating takes a certain amount of finesse. Learn the #1 must for your dating profile to attract the right kind of single boomers. Love might be right around the corner.